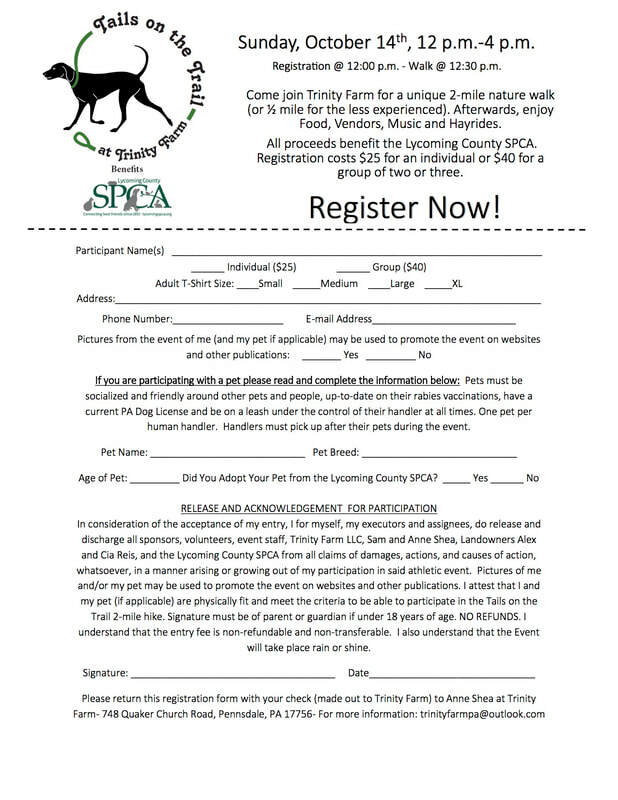 Watch for the date for our next "Tails on the Trail" in October 2019- a unique 2 mile nature walk with your dog in the hills of Pennsdale to benefit the Lycoming Co SPCA. Enjoy the beautiful countryside and breathtaking views of the area with your furry friend. The mission of the Lycoming Co SPCA is to protect all domestic animals by providing Shelter, emergency treatment, investigation and prosecution of cruelty or abuse complaints, adoption and counseling, education programs and humane care through Lycoming County. It is the goal of this event to further the mission of the SPCA. Trinity Farm is a family farm located in Pennsdale Pa, just 2 miles off I-180. Trinity Farm is a full service dog boarding facility in a country setting. We offer daily or weekly care for your dog with walks and playtime available. Dog grooming is also available on site by certified groomers.